A fairly well-known religious leader, Tim Keller, recently commented in the New York Times, "Christians should be involved politically as a way of loving our neighbors, whether they believe as we do or not." Keller offered working for "better public schools" as an example. His comments were widely applauded by well-meaning Christians. [Here's the link to read his piece in full]. The problem with a "politics as love" concept is that it is elitist and coercive. There isn't a single authoritarian who would disagree with the idea that they know what's good for everyone and they must force their understanding of what's good on everyone whether others agree with it our not. You may say that's not what Keller meant but that's reality. We're going to do this "whether they believe as we do or not" is power politics. It is coercion. We win, you lose. Hopefully you come to see that we're loving you. If not, we know what's "loving" better than you anyway. Politics is power and coercion. As long as one party gets 50.1% of the votes, they receive the "right" to tell you to compromise your deeply-held beliefs by force of law. Which is another way of saying "at the point of a gun." Try to not comply. See what happens. It's a very strange twist to view this as love. Politics As Christian Love has become ascendant among evangelicals looking for a "third way." Loving your neighbor by acting politically on their behalf, however, is just another way of allowing political elites to co-opt the language of Christ for purposes that have nothing to do with Christ. Looking to the politics of the American state rather than the supranational Kingdom of God as the expression of Christ’s command to love our neighbors is idolatry. Rather than acting politically to impose our vision of the common good on our neighbor’s behalf whether they want us to or not, we could promote voluntary interactions, liberty, non-aggression, and serving others in order to allow people to peacefully pursue what they believe to be “good.” We could use persuasion and peacemaking when we inevitably disagree on what “good” looks like. Otherwise we are simply engaging in good ol’ power politics, even if we pretend it’s love. Keller ends his piece by stating, "The Gospel gives us the resources to love people who reject both our beliefs and us personally. Christians should think of how God rescued them. He did it not by taking power but by coming to earth, losing glory and power, serving and dying on a cross. How did Jesus save? Not with a sword but with nails in his hands." This final paragraph should have made the rest of his article unnecessary. He could have led with this statement and then gone on to explain how to use these resources "the Gospel gives us." But this wouldn't have gotten him a byline in the New York Times. On a side note, why would the NYT publish an article like this? Because it drives Christians away from the GOP and toward the Democrat Party. I am not saying this was Keller's goal. It wasn't. He was simply used. The NYT, CNN, and Washington Post do not publish leaders like Keller, Russell Moore, and Ed Stetzer unless what they have to say is critical of conservative evangelicals. Go look at their articles for these three outlets. See if I'm wrong. It goes like this. For the past two years everyone has hammered home that evangelicals, specifically white evangelicals, are almost completely aligned with the GOP and this is a bad thing. Amen. So evangelicals need to distance themselves from the GOP. And voting third party is a wasted vote. And we have a sacred obligation to vote. It's loving our neighbors. So where does that leave us? Well, it's time to start voting for some Democrats. Keller says Christians should not align themselves with any one political party. He says thoughtful Christians, all trying to obey God’s call, could reasonably appear at different places on the political spectrum, with loyalties to different political strategies (is this really true?). He says we should avoid "package-deal ethics" by refusing to embrace all of one party's approved positions. So Christians are already being told to disassociate themselves from the GOP, reasonable God-loving folk are going to be all over the political spectrum, and we shouldn't endorse a party's entire platform. He's already established that politics is a good way to love our neighbors. According to the prevailing wisdom of the world, which party is "committed to racial justice and the poor"? Again, it's time to start voting for some Democrats. I'm not saying this was Keller's goal. I'm saying this is why the New York Times would publish an article like this. It serves their purposes. It's one more boost to get evangelicals to start voting for Democrats. Remember, we have an obligation to vote because politics is Christian love and the prevailing wisdom tells us voting third party is a waste. So where does that leave us if we need to leave the GOP? 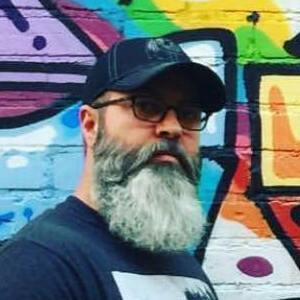 Jeff Wright, Jr. is a prison pastor, holds a Master of Theology (ThM) from Dallas Theological Seminary, and is a member of the Evangelical Theological Society. Jeff is a very blessed husband and daddy, loves serving his local church, and enjoys all things Star Wars. He not-so-frequently-anymore writes for the Libertarian Christian Institute. You can also find him @jeffwrightjr. 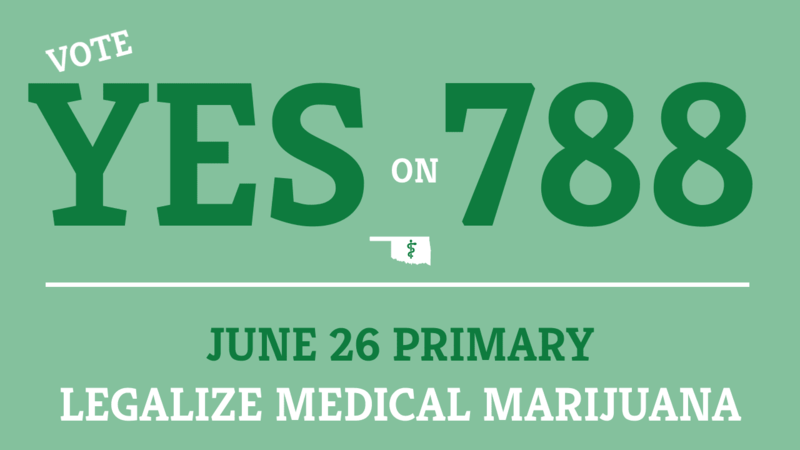 On June 26th, Oklahomans will vote on State Question 788: the Medical Marijuana Legalization Initiative. While SQ788 should pass fairly easily, some Christians from both inside and outside the state have mounted an effort to dissuade Oklahomans from voting for legalization. 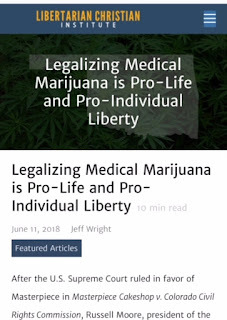 As I address in Legalizing Medical Marijuana is Pro-Life and Pro-Individual Liberty, much of the rhetoric coming from Southern Baptist leaders on this issue is, sadly, based on scare tactics and misinformation. The Ethics and Religious Liberty Commission of the Southern Baptist Convention offers resources on the topic of marijuana (all opposed to legalization). 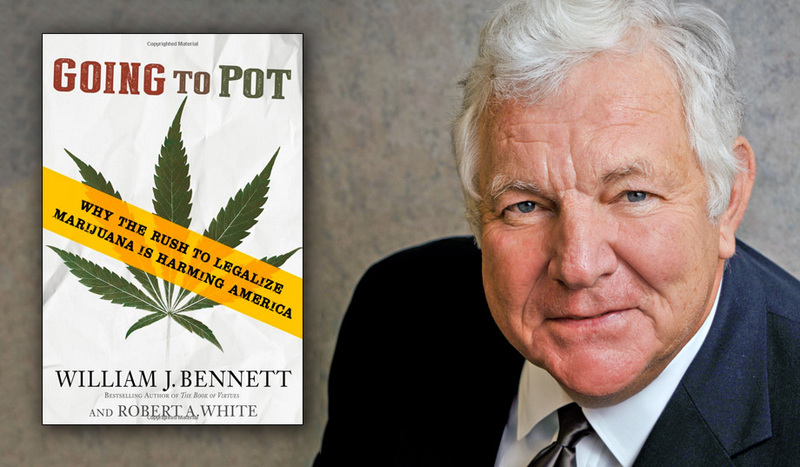 One of those resources is an article entitled, Going to Pot: Why the Rush to Legalize Marijuana is Harming America based on the book by William Bennett and Robert White of the same name. The author, Barrett Duke, hails the book as "a very helpful, practical refutation of the marijuana legalization effort" and claims it "effectively dismantles every serious argument being put forward by the legalization crowd." Duke highlights a few of Bennett's key assertions that have often been repeated by Baptists opposed to both medicinal and recreational marijuana. Marijuana use is dangerous, contrary to sobriety and self-control, and will make the drug problem worse.The benefits of medical marijuana are a myth and legalizing medicinal use is just a front for full legalization. Duke touts the book's "helpful guidance for a successful return to a government program to reduce illicit drug use rather than capitulation." (Medicinal use of marijuana would literally no longer be illicit after legalization, just saying). The Baptist position is basically prohibition plus doubling down on the failed war on drugs. Jacob Sullum, senior editor at Reason magazine and contributor at Forbes.com, responded to Bennett's book with Bill Bennett's Confused And Confusing Defense Of Pot Prohibition. Far from "dismantling every serious argument being put forward by the legalization crowd," as Duke proclaimed, Sullum found Bennett's book to be "a rambling, repetitive, self-contradicting hodgepodge of scare stories, misleading comparisons, unsupportable generalizations, and decontextualized research results." Sullum "dismantles" every key argument made by Bennett and White. Those who have come accustomed to taking the usual prohibitionist talking points for granted would do well to consider his rejoinder. Rather than recite his counter-arguments, I want to highlight a couple of key points that are often missed in this debate. 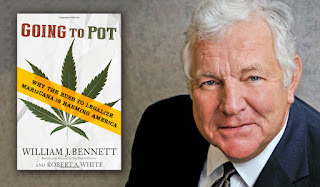 Bennett and White state, "We can add to the menu of dangerous substances available to our citizens, or we can draw a line and admit we are surfeited with the problems that already exist." Sullum's response is, "That is the real crux of Bennett and White’s argument, and it depends on accepting their premise that using force to stop people from hurting themselves is morally justified." Should Christians advocate for the use of force to stop people from hurting themselves, as Sullum puts it? If the answer is "yes," we need to greatly expand the list of actions and substances to prohibt. But does this get to the heart of the matter? Does the Gospel offer another way? What is the ultimate right being argued for?...At the end of the day the right is, simply put, a right to get and be stoned. This, it seems to us, is a rather ridiculous right upon which to charge a hill. This is like saying that freedom of speech is the right to tweet about the latest episode of American Idol, or that freedom of religion is the right to believe silly things and engage in pointless rituals. It is true as far as it goes, but it overlooks the broader principle. Drug prohibition dictates to people what substances they may ingest and what states of consciousness they may seek, thereby running roughshod over the principle that every man is sovereign over his own body and mind. Even if marijuana is not as bad as they portray it, Bennett and White ask, “Do we need it?” They think cannabis consumers need to justify their freedom, when it is prohibitionists who need to justify forcibly imposing their pharmacological preferences on others. After so many years of taking that power for granted, it’s hardly surprising they are not up to the task. Conservatives and libertarians differ greatly when it comes to these points: is it permissible and/or wise to use force to stop self-regarding behavior as well as actions that harm others? Should force be used to prohibit or respond to injuries that do not violate another person's rights in addition to those that do violate another's rights? Is each individual sovereign over their own body and mind? Do people have a right to impose their "pharmacological preferences" on others? If so, on what grounds? 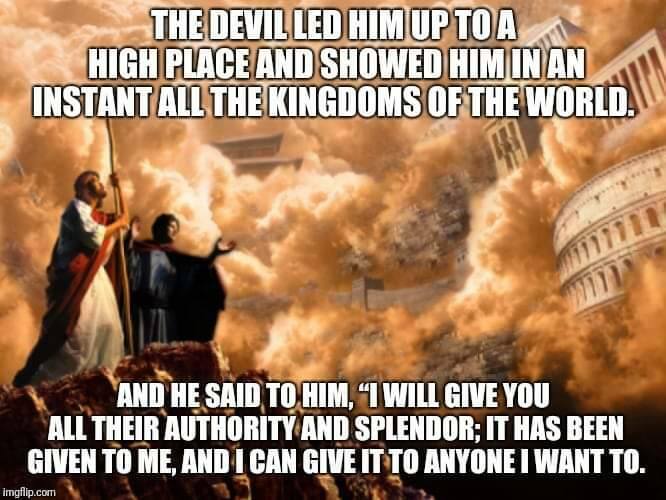 Along with Bennett and White, Christians have taken this power for granted for a long time. Many Christians, including Baptists, are beginning to question the validity of prohibition, especially when it comes to medical marijuana. May this discussion continue because the principles involved apply to much more than drug legalization. Jeff Wright, Jr. is a prison pastor, holds a Master of Theology (ThM) from Dallas Theological Seminary, and is a member of the Evangelical Theological Society. Jeff is a very blessed husband and daddy, loves serving his local church, and enjoys all things Star Wars. He regularly writes for the Libertarian Christian Institute. You can also find him @jeffwrightjr. 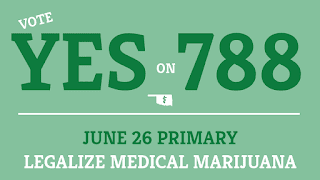 My latest on medical marijuana and SQ788 in Oklahoma is up at the Libertarian Christian Institute. 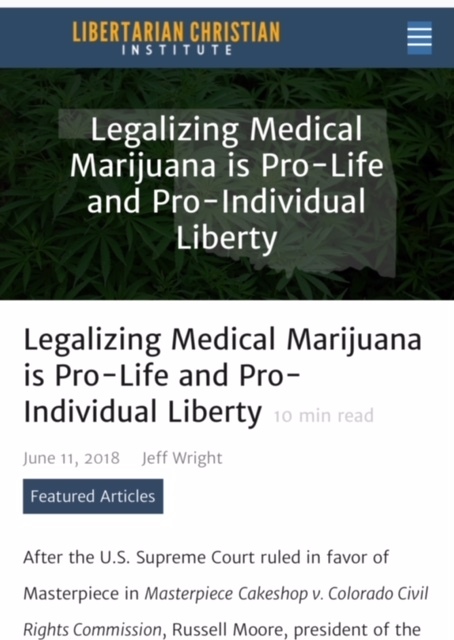 Hopefully in some small way this can serve to counter the misinformation being put out about the dangers and benefits of medical marijuana from a Christian perspective. Christians in America continue to wrestle with the challenge of how best to engage politically following the corrosive aftermath of the 2016 Presidential election. Some evangelicals spent the first year of Donald Trump’s presidency drawing even brighter lines between the Trumpvangelicals and the #NeverTrumpers with each tribe trying to write the other out of the evangelical movement. The battle escalated when Roy Moore secured the GOP nomination for Senate in Alabama despite the emergence of allegations of sexual misconduct. Many have wondered if the term “evangelical” is even salvageable after being so closely associated with Trumpism and defenses of Roy Moore. As the finger pointing has begun to subside, options for the way forward have begun to emerge. Disappointingly, evangelicals continue to focus primarily upon the state rather than the Kingdom of God as the means of advancing the common good. One emerging approach is what we could call the Love Your Neighbor strategy. This approach can be seen in the recent work of author and former White House staffer, Michael Wear. During Barack Obama’s first term, Wear served in the White House faith-based initiative and then directed Obama’s faith outreach effort during the 2012 campaign. His book, Reclaiming Hope: Lessons Learned in the Obama White House About the Future of Faith in America, was endorsed by evangelicals such as Tim Keller, Russell Moore, and Andy Stanley and enjoyed a glowing review posted at The Gospel Coalition. (While I use Wear’s writing as an example of a sentiment I commonly see expressed by evangelicals, I do not intend to imply he would endorse the following approach exactly as I state it). 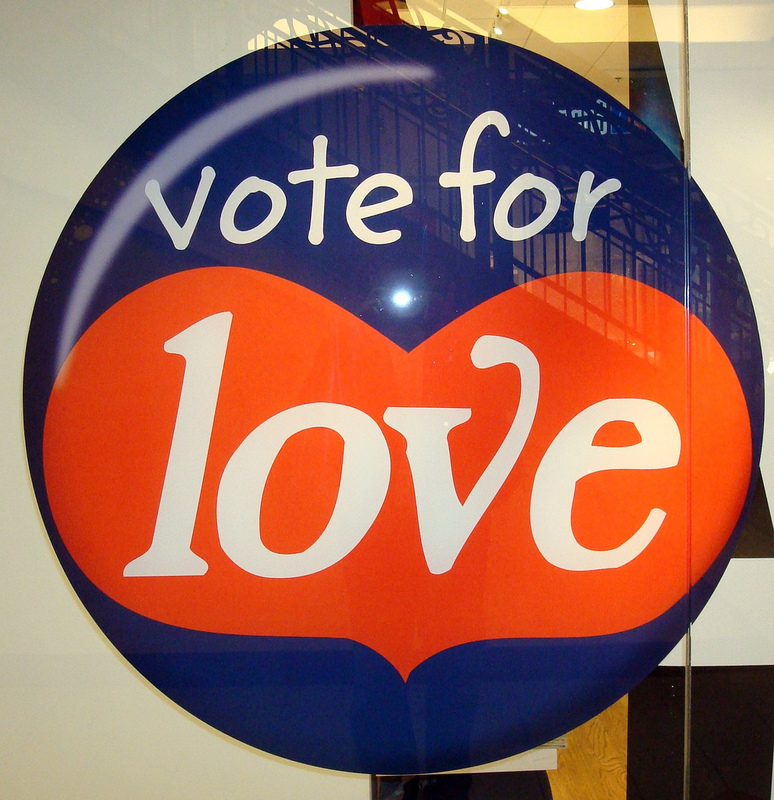 The Love Your Neighbor strategy sees politics as a significant means of demonstrating our love for our neighbors (and God) by voting in such a way as to promote the common good. It assumes that government is a benign, neutral body existing to represent the will of the people for the good of the people. If the people would simply choose good, moral, and wise representatives, they will by and large do what is best for the country. Sounds great, right? What could be wrong with that? A Love Your Neighbor approach to politics is begging to be co-opted by politicians. 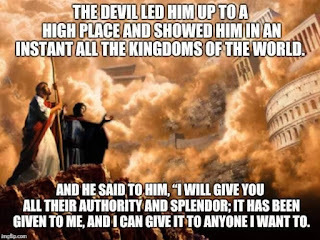 Politicians love to leverage the rhetoric and sentiments of Christianity to further their agendas, and naïve Christians fall for it time and time again. Michael Wear fell for it as Obama’s Faith Outreach Director just as Eric Teetsel fell for it as Marco Rubio’s Faith Outreach Director, along with evangelicals such as Albert Mohler and Wayne Grudem who lend their names and reputations to the meaningless ‘Faith Advisory Boards’ of elites seeking greater power. Loving your neighbor by acting politically on their behalf is just another way of allowing political elites to co-opt the language of Christ for purposes that have nothing to do with Christ. Looking to the politics of the American state rather than the supranational Kingdom of God as the expression of Christ’s command to love our neighbors smells a lot like idolatry. Rather than acting politically to impose a vision of the common good on our neighbor’s behalf whether they want us to or not, we could promote liberty and non-aggression in order to allow people to peacefully pursue what they believe to be “good.” We could use persuasion and peacemaking when we inevitably disagree on what “good” looks like. Otherwise we are simply engaging in good ol’ power politics, even if we pretend it’s love. This post originally appeared at The Libertarian Christian Institute. Jeff Wright, Jr. is a prison pastor, holds a Master of Theology (ThM) from Dallas Theological Seminary, and is a member of the Evangelical Theological Society. Jeff is a very blessed husband and daddy, loves serving his local church, and enjoys all things Star Wars. He frequently writes for the Libertarian Christian Institute. You can also find him @jeffwrightjr. 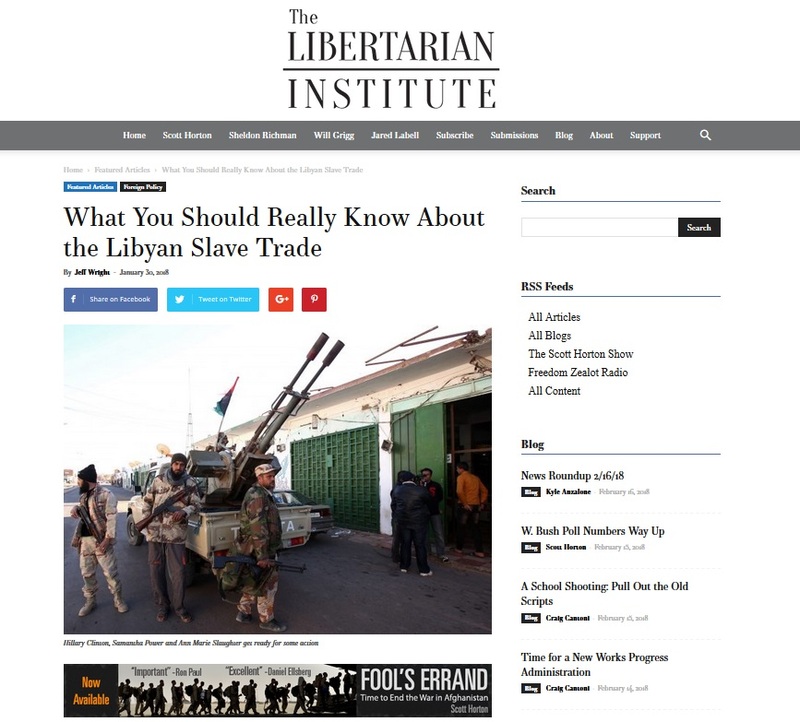 Thanks to The Libertarian Institute for running my take on American evangelicals and the Libyan slave trade.